When one considers that heart attacks are the number 1 cause of death in Malaysia, the IE Wellness section felt that it was important to talk about matters of the heart – the physical kind. 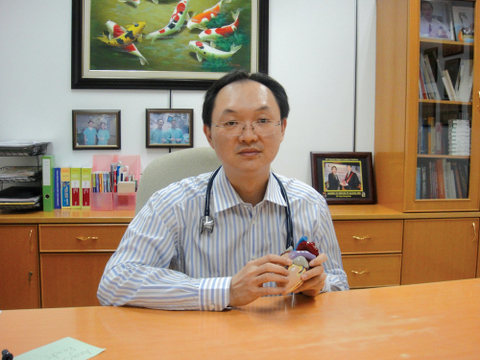 We sought out Consultant Cardiologist Dr. Chan Chong Guan at Pantai Hospital to share his thoughts and expertise on prevention and management of heart attacks. IE: What is a heart attack? Dr. Chan: A heart attack occurs when the supply of blood and oxygen to an area of heart muscle is blocked, usually by a blood clot in a coronary artery. Often, this blockage leads to arrhythmias (irregular heartbeat or rhythm) that cause a severe decrease in the pumping function of the heart and may bring about sudden death. If the blockage is not treated within a few hours, the affected heart muscle will die and be replaced by scar tissue. A heart attack is a life-threatening event. Everyone should know the warning signs of a heart attack and how to get emergency help. Many people suffer permanent damage to their hearts or die because they do not get help immediately. Without immediate medical attention, about half of them die. About one-half of those who die do so within the first few hours of the start of symptoms and before reaching the hospital. Emergency personnel can often stop arrhythmias with emergency CPR (cardiopulmonary resuscitation), defibrillation (electrical shock), and prompt advanced cardiac life support procedures. If care is sought soon enough, blood flow in the blocked artery can be restored in time to prevent permanent damage to the heart. Yet, most people do not seek medical care for 2 hours or more after symptoms begin. Many people wait 12 hours or longer. IE: What are the signs and symptoms of a heart attack? Dr. Chan: Not all heart attacks begin with a sudden, crushing pain that is often shown on TV or in the movies. The warning signs and symptoms of a heart attack aren’t the same for everyone. Many heart attacks start slowly as mild pain or discomfort. Some people don’t have symptoms at all (this is called a silent heart attack). The most common symptom of heart attack is chest pain or discomfort. Most heart attacks involve discomfort in the centre of the chest that lasts for more than a few minutes or goes away and comes back. The discomfort can feel like uncomfortable pressure, squeezing, fullness, or pain. It can be mild or severe. Heart attack pain can sometimes feel like indigestion or heartburn. The more signs and symptoms you have, the more likely it is that you’re having a heart attack. IE: What are the risk factors for heart attack? Dr. Chan: If someone is diabetic, overweight, has high cholesterol, smokes, has high blood pressure, and there is a family history of heart attack, then we’d classify this person as high risk even if no symptoms are present. There is a standard chart that we use for estimating the risks of 10-year coronary heart disease (CHD) risk for both men and women. Called the Framingham Point Score, this chart takes into account the age, total cholesterol, smoker/non-smoker, HDL cholesterol, systolic blood pressure and assigns points to all these factors to come out with a total score with percentage points for 10-year risk. While this is not 100% accurate, it does help us cardiologists to plan treatment options with the patient if the risk is found to be high. Studies in the US have shown that deaths from CHD have dropped by 50% over a 20-year period from 1980 to 2000, 44% of which is attributed to changes in lifestyle which reduced the risk factors, while 47% was due to active treatment. It is important to point out that when one has an artery blockage of less than 70%, there are no symptoms. It is only when the blockage is more than 90% that a patient will exhibit chest pains on minimal exertion. This is when aggressive treatment is necessary either with blood thinning drugs to prevent blood clots or with angioplasty (when they insert a catheter into the area of the blockage and treat in a variety of ways – to be covered in part 2 next issue). IE: So what is your final advice on matters of the heart-the physical kind? Dr. Chan: First it’s the matter of time; if you think you may be having a heart attack, get yourself as quickly as possible to a hospital with Emergency Medical Services and describe your symptoms. The Gold standard for treatment is within 90 minutes for achieving reperfusion (re-opening of a blocked artery). Secondly, change your lifestyle if you have some of the risk factors mentioned earlier. It could save your life. Dr. Chan Chong Guan at Chan Cardiovascular Specialist Clinic, Pantai Hospital Ipoh. Tel. : 05-5405522. In our continuing series on Eye Health, Consultant Ophthalmologist Dr. S.S. Gill talks to us about Eye Stress. People who are addicted to using their smartphones may be having fun with playing games or surfing the internet, but do not realise that their eyes are stressed by the hours of staring that they do. Our eyes are in actual fact biologically not designed to stare at a computer screen all day long. If we were out “hunting” and “gathering” as we were made out to be, our eyes would get their natural break from intensive close-range staring that many people do in today’s modern age. All the staring at computers and smartphones for long hours each time means “we are getting our eyes to do something they were not meant to do”! Unfortunately for our eyes, we do live in a world surrounded by gadgets that demand this kind of staring activity. We may be switching from using our smartphone to using the computer, and then to reading an e-book on our iPad, placing the same stressful demands on our eyes. The long hours spent using these gadgets do not help as well. Interestingly, both men and women suffer from eye strain although women are reporting more eye and vision problems associated with their screen time than men. This is possibly because women are more prone to dry eyes than men. It is not really known why women experience the dry-eye syndrome more than men do, but it has been speculated that hormones do play a part in tear production. The hormonal changes that occur in peri-menopausal (just around the time when menopause begins) and of course menopause itself can explain why older women are more susceptible to dry eyes, which is contributing factor towards eye strain. Dry air in an air-conditioned environment also adds to symptoms of eye strain and fatigue. If you work in a place where the air-conditioning is extra efficient, for example in a deli or supermarket, or in a corporate office environment, the symptoms and discomfort may worsen if you suffer from dry eyes. This is why some women develop bloodshot eyes after spending some time in a supermarket and may even look like they have had a few shots of alcohol! It is good to remember that our eyes are in their most relaxed state when looking into the distance. This is where the 20-20-20 rule is helpful when practised. For every 20 minutes of doing concentrated near-work, look 20 feet into distance for at least 20 seconds. This deliberate activity relaxes the ciliary muscles used for near accommodation, thus reducing eye stress. For more information on Eye Health, contact Gill Eye Specialist Centre at 05-5455582, email: gilleyecentre@dr.com or visit www.fatimah.com.my.